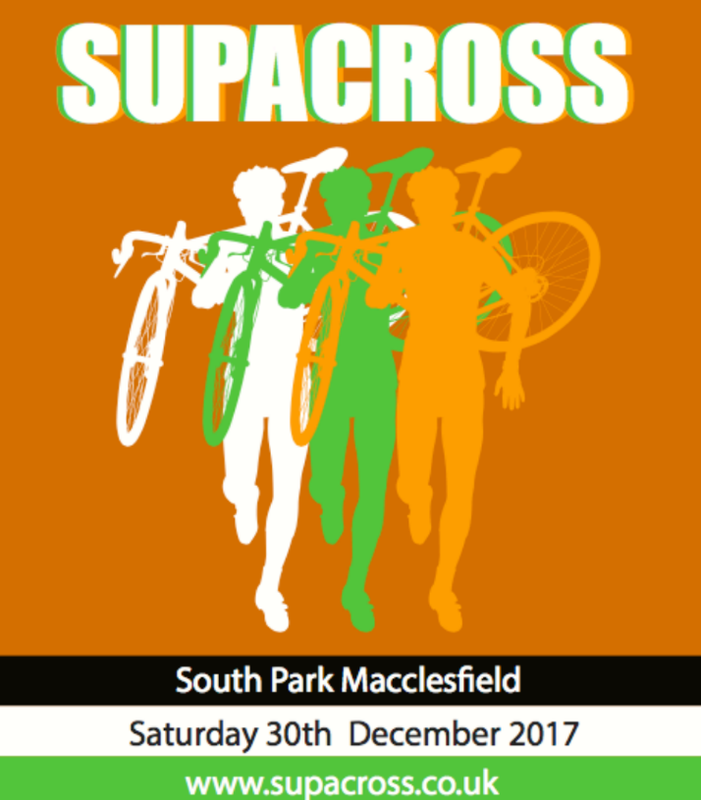 Seasons greetings all and welcome to the Preview for the forthcoming Supacross 2017, organised and promoted by Macclesfield Wheelers. You can expect, as ever, a great programme of racing catering for all ages and abilities in a challenging, fun and safe park with great views towards the beautiful Peak District and easy transport links to the M6 (20mins) and A34/M56 (20mins). Our HQ is once again at the Tennis Club within Macclesfield College grounds (SK11 8LF), Park Lane. It boasts plentiful parking, showers and a nice clubhouse for signing on and providing hot drinks and cakes. The course is a 2minute ride away via Ryles Park road. Please use the car park at the tennis club/Collage -DO NOT PARK ON PAVEMENTS OR VERGES, ONLY IN PARKING BAYS!! and if you must park nearer the park please be respectful of residents, their driveways and verges. Refreshments will be available in the Park this year with hot food and drinks being served from Dronsfield’s Catering. We are for ever grateful to the local businesses whom support the event and provide sponsorship. Cyclestore.co.uk, Don Massey Jewellers, Ride and Repair and Process Components are this years main sponsors, please see flyer for others. Over the years we have always attracted some of the leading Cyclocross racers and this year promises to be no different. This event is one of the last before the National Champs being held the weekend of 13/14th January and riders will be looking to hone their form at our event. Nick Craig and Giles Drake are just some of the big names who will be featuring in the Supacross. Please note sign on closes 25 minutes before each race with gridding 15 minutes prior to the race start times.